Life has been hard lately. I’ve had to make some heartbreaking choices. I’ve been plagued by “what ifs?” My depression, which was already bad, has gotten worse. I try to tell myself it will get better. I try to tell myself that it will improve. I try to tell myself that it won’t always be this dark and bleak. But it’s hard. As I take my medication cocktail of Pristiq, Buspar, and Seroquel I find myself wishing I didn’t have to do this. I find thoughts I don’t like dancing in my head. I find myself completely trapped in depression. 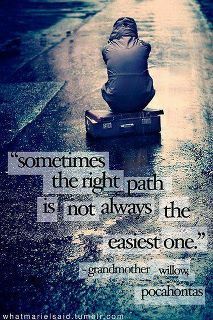 And I wonder if there’s an easier path. I wonder if there are choices I could make that may not be right ,but may make it easier. I wonder if there’s a way I will no longer be trapped in the vortex of depression. I find myself just wishing there was an easy way out – but I know it isn’t right. I know it isn’t what I need. But damn, it’s so hard when what’s right and what’s easy are worlds apart. So tired that I couldn’t even sleep, so many secrets I couldn’t keep. Promise myself I wouldn’t weep, at one more promise I couldn’t keep. It seems like I’m trapped. I have so much I should be hoping for and dreaming for and looking forward to – but none of it, right now. Right now I’m so completely trapped. And I hate every moment of it. I hate this feeling. my heart aches for how you are feeling. hoping you are able to come out of “it” soon… i just spent 2 months in bed, feeling like a weight was holding me down. this past 2 weeks i’ve been able (made myself) to be out in public for 8 hours a day… it’s so draining, but i’m doing it. wishing you the best!